There’s something about the end of year holiday time that makes people relax and let down their guard a bit. We all spend a bit more, eat a bit more, and stress a bit less. It’s called the ‘silly season’ for a reason. Unfortunately, fraudsters and scammers recognise this as an opportunity, and they take advantage. Every year, police and the ACCC’s ScamWatch receive complaints about tens of millions of dollars lost to Christmas-related scams. Unfortunately, most people don’t get their money back. 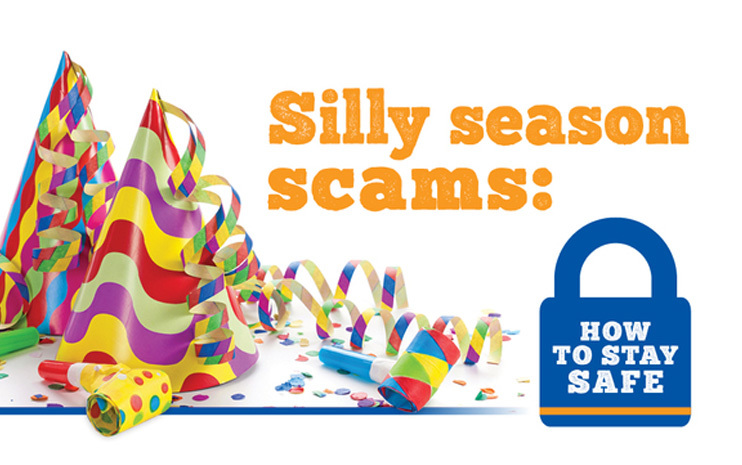 In addition to the normal vigilance you’d apply to online security and too-good-to-be true offers, there are a few particularly nasty Christmas scams to be wary of. Avoid these and you’ll save yourself a lot of heartache (and money) come holiday time. It’s all too easy for scammers to set up fake designer brand websites that look just like the real thing. They might have domain names that include another word like ‘cheap’ or ‘outlet’ alongside the brand name, but that’s the only difference. These sites purport to sell brand name goods at massive discounts, luring in bargain hunting Christmas shoppers. But of course, the purchases never arrive.Make sure you’re buying from either a well-known retailer, such as a department store or major online retailer with lots of contact methods and a well-documented complaints policy. For individual brand sites, check to make sure the URL starts with ‘https’, and that there’s a protected payment option like PayPal. If you’ve got loved ones interstate or overseas, or if you’ve bought some presents online, you might be expecting a parcel delivery notice. But don’t open any attachments to emails you receive purporting to be from Australia Post or a courier company – they might contain malware. In 2015, hundreds of people were caught out by a fake ‘missed delivery’ email that installed ransomwarei.If you receive a suspicious email like this, delete it and run a virus scan for safety. Look in your letterbox for a small postcard sized notice. That’s how Australia Post (and many couriers) usually let you know you’ve missed a delivery. For online shopping, you may also be able to track your parcel with the details sent to you by the retailer along with your receipt. Fraudulent charity collections come in a number of different forms. Sometimes, they’re entirely fake charities, and the scammers are banking on you being too busy or distracted to look them up before tossing a few dollars their way. Other times, they look convincingly like the real thing, right down to the donation buckets and ‘official’ ID tags.To make sure you’re giving to a real charity, the easiest option is to bypass collectors in the street and go straight to the source. Think about the causes that are important to you, and choose a charity to donate to ahead of time. Refer to the Australian Charities and Not-for-profits Commission to see if a charity is registered, and to check contact detailsii. A number of retailers have been in trouble with the consumer watchdog over the past few years in relation to their gift cards. Some gift cards have an unreasonably short expiry date, making it unlikely that the recipient will ever redeem them. Others have restrictions on when they can be used, such as restaurant or entertainment vouchers that can’t be used at peak times. Many don’t allow you to get more than a certain amount of change back in cash. Before purchasing gift cards for friends and family, it’s a good idea to get up to speed with your consumer rightsiii.Remember to trust your instincts when it comes to spending cash or using your credit card, but don’t let a fear of scams stop you from having a great time. Happy holidays!